SPEEDWELL took over to Belgium last week an Austin-Healey Sprite G.T. Coupé and a special bubble-topped streamliner, to make some officially timed high-speed runs; these took place on the rather blustery morning of 13 April, on a stretch of the Antwerp-Liege motorway. Graham Hill, director of Speedwell Performance Conversions, Ltd., did four runs with the G.T. Coupé, two in each direction over the kilometre. These were all that was required to attain the target speed110.9 m.p.h. Considering that the car used is the one which has been raced so successfully by Venner-Pack, and has received little attention since the beginning of the season, this was an extremely meritorious performance. George Hulbert then took out the fully streamlined car designed by himself and Frank Costin; because of breakdowns in the timing apparatus, and the need for small modifications to the cockpit to prevent the driver from being affected by fumes, not so many runs could be made as it was hoped, before the road was opened again. On a methanol-based fuel, a mean time of 128.78 m.p.h. was reCorded; when this fuel was replaced by a nitro-additive mixture, a run at 132.2 m.p.h. was achieved. After four runs, two each by George Hulbert and Graham Hill at around the 132 m.p.h. mark, there was insufficient time	left, unfortunately, for experiments with larger tyres. Since the engine speed went above the power peak with the smaller tyres, it is safe to assume that the odd mile an hour or more could have been obtained with a higher overall ratio, provided by larger tyres. Both cars collected their respective Belgian National Class reCords. Considering that the B.M.C. EX.219 International G class reCord car-also based on a Sprite-achieved, in blown form, 146.95 m.p.h., for an hour, this Speedwell venture, with only a minute proportion of the B.M.C. resources, is indeed praiseworthy. What is more, basically the body and chassis are still Austin-Healey Sprite. The future of this special is still undecided, but one can safely assume that it will not remain idle. 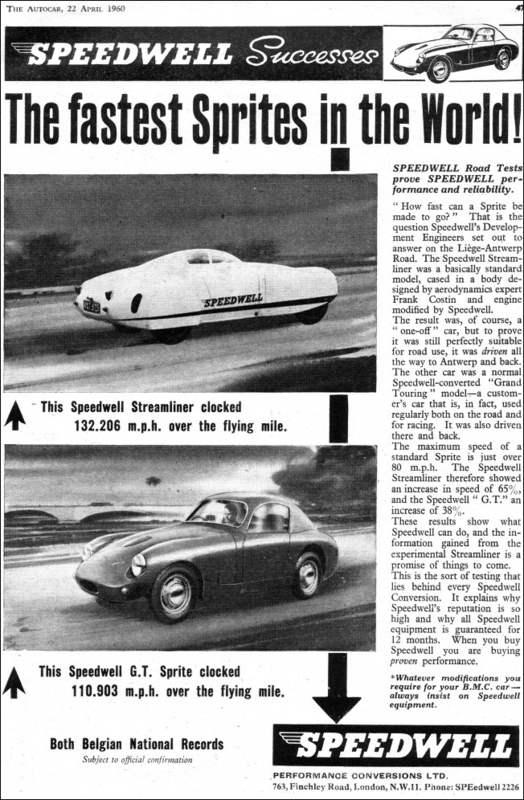 Figures for the fastest runs made by both cars, and which when ratified will stand as the new flying kilometre, Belgian National Class G reCords, are: Speedwell Streamliner 132.2 m.p.h. (212.8 k.p.h. ); Speedwell G.T. Coupé. 110.9 m.p.h. (178.5 k.p.h. ).